It took me awhile to understand being a father is easy but becoming a great dad is difficult. You don’t need a degree or license to become a father. Fatherhood rarely begins as you expect it to or unfolds as you plan. It is indiscriminate in its ability to reveal and demonstrate how ill equipped you are to run this race. Fatherhood is a strange paradox—testing your resolve and commitment like few things can and providing joy like nothing else can. It may be the essence of clinging to the obligation and responsibility of being a father long enough to understand how becoming a dad creates a lasting and rippling impact on our kids. Something has gone terribly wrong over the nearly 100 years since Coolidge’s proclamation. More than 17 million (approaching 25%) of all children in the United States live in father-absent homes! drop out of high school. have children outside of marriage. Being a father is easy. It’s becoming a great dad that is hard. My dad passed away nearly 14 years ago and there are not too many days that go by that I don’t think about him. I’ve grown in my appreciation of his commitment and journey to becoming a dad. Many of you have read Tape Breakers and know the first chapter (An Unlikely Source of Clarity) is about my dad. In researching his story for the book and now talking about him and his journey since the book was released, I am so thankful that he demonstrated the courage and commitment to not only fulfill the “full measure of his obligation”, but learned how to become a great dad. What Does It Take to Become a Great Dad? My dad was a man of few words. He didn’t need to say too much because his example spoke volumes. If I could ask him today, “Dad, what does it take to be a great dad?,” here is what I think he would say. Who do you want to be remembered by? If you are a father or a mother, I pray your kids are on the top of this list. It provides focus, inspiration and motivation to run with courageous mindfulness of our impact and influence. Yesterday is unimportant in this race. Today is what counts. Do the next right thing—right! If you truly want to be fondly and appreciatively remembered by your kids, do the next right thing whatever that may be. Everyone writes a story with his or her race. For the kid’s in our lives, let’s run a race that weaves together a story bold enough and big enough that it changes their lives, inspires their hearts and unlocks bold and courageous possibilities in their lives. Today is a great day to find the starting line and embrace being the hero of your race—On your mark! Question: What is the best advice your dad would offer? I’d love to see your comments below. You can leave a comment by clicking here. The Father Connection: How You Can Make the Difference in Your Child’s Self-Esteem and Sense of Purpose (Right Your Wrong) by Josh McDowell. Josh provides simple and principle counsel that can be easily applied. Friday Night Lights for Fathers and Sons: Schedule a 10-game winning season to help develop your son into the man God intended him to be by Mark LaMaster. Great resource for building your relationship and connection with your son. Finishing Strong: Going the Distance for Your Family by Steve Farrar. Steve is one of my favorite writers. This is one book amongst his many are outstanding guides and resources for men as husbands, fathers and leaders of their family. The 7 Secrets of Effective Fathers: Becoming the Father Your Children Need by Ken Canfield. This book was written in 2001. But the principles are timeless and supported by extensive research. I'll send you the 1st Chapter of Tape Breakers for free! Put a quick boost of encouragement and inspiration in your mailbox. 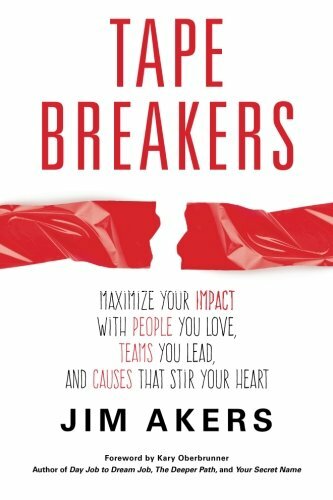 I am the author of Tape Breakers: Maximize Your Impact with People You Love, Teams You Lead and Causes that Stir Your Heart—a “#1 New Release” on Amazon. As the founder and creator of ImpACTful Notes—we developed a powerful resource for daily encouragement, inspiration, and motivation. I am the founder and CEO of J. D. Akers & Associates, a leadership and personal development company. We help ambitious people focus their time, talent and resources on maximizing their personal and professional impact. If you are passionate about being successful and acting to positively change the lives of the people you love and lead, we can help. Welcome! 14 Powerful Strategies You Can Put to Work Today! I am a coach, speaker and author. I help passionate, ambitious people focus their time, talent and resources on maximizing their impact with the people they love, teams they lead and causes that stir their heart. Want to grow in your career. Prioritize faith, marriage and family at the top. Desire balance the growing complexities of a busy life. Are in the midst of an important life transition. Seek proven resources for realizing dreams and achieving goals. Powered by the Get Noticed! Theme.